Some believe she already has." While two warriors were out hunting buffalo, a white buffalo calf suddenly appeared. As she approached them she changed into a beautiful young woman . . . which is how she came to be called the White Buffalo Calf Woman. One of the young warriors offended her with his lustful thoughts and White Buffalo Calf Woman asked him to approach. A beautiful, and different, telling of the story of the White Buffalo Calf Woman is provided by Matthew Richter in American Comments, a web magazine fighting racial hatred and discrimination. This version tells the story of how a woman called the Mother of Life came to become the White Buffalo Calf Woman and discusses the meaning of the pipe and the prophesy. "Now, more than any time in history, we need the sacred feminine to balance our lives and to balance our world. We must be spiritual warriors…culling the profound and important aspects of the power of feminine wisdom and directing them toward peace within, as without, and utilizing the energies of the goddess and all mythical women and spiritual heroines to help direct the course of history." *In 1994, a white buffalo calf was born on a farm in Wisconsin. . .
the first white buffalo born in decades. 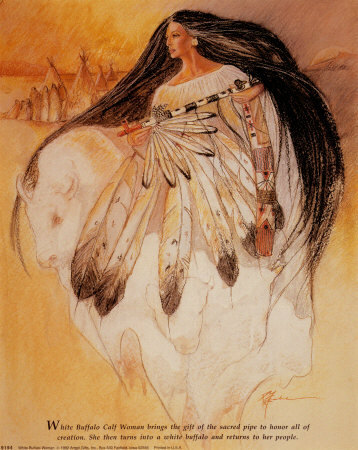 the White Buffalo Calf Woman will herald the advent of an age of peace and harmony. I am aware of this story.....very beautiful....thank you for sharing ! I came across another story about buffalo women today ~ I love these stories and spiritual insights.